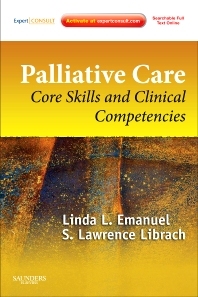 Find out all you need to know about providing high-quality care to patients with serious illnesses from the 2nd edition of Palliative Care: Core Skills and Clinical Competencies. Drs. Linda L. Emanuel and S. Lawrence Librach, leaders in the field, address the clinical, physical, psychological, cultural, and spiritual dimensions that are integral to the care of the whole patient. They give you a broad understanding of the core clinical skills and competencies needed to effectively approach patient assessment, care of special populations, symptom control, ethical issues, and more. Clearly written in a user-friendly, high-yield format with convenient online access, this resource is your ultimate guidebook to the burgeoning practice of palliative medicine. Improve your pain management and symptom management skills with a better understanding of best practices in palliative care. Quickly review specific treatment protocols for both malignant and non-malignant illnesses, including HIV/AIDS, heart failure, renal failure, pulmonary disease, and neurodegenerative disease. Better understand and manage the common and unique challenges associated with delivering palliative care in various social settings, such as the ICU, hospice, and the home; and to diverse populations, such as children, elders, and vulnerable members of society.